Clair is pretty sure the offer in the ‘Improvement' meme is just another viral spam, though Libby is determined to give it a try. But what starts as Libby's dream turns into Clair's nightmare when her friend vanishes. In her search for answers, Clair seeks out Jesse - a boy whose alternative lifestyle might help to uncover the truth. What they don't anticipate is intervention from the mysterious contact known only as Q, and being caught up in a conspiracy that will change everything. I received a physical copy of this book from the publisher Electric Monkey in exchange for an honest review. This does not effect my opinion on the book whatsoever; it's my true opinion only. I thought the storyline on a whole was really good. I liked the world inside the book. Based in the future where social networking is so more advanced than today. It is a sci-fi novel. I haven't read many sci-fi books in my life, so it was interesting to jump into this one. I loved learning about the new scientific terms like "bumping" someone and "jumping" to and from a place. D-mats and lenses...ahh so much! But I did enjoy the fact there was a lot. Even though at times it did seem too much for my mind to handle! I suggest mentally preparing your mind for this book. Twinmaker is completely action-packed and full of mystery. I liked this element to it. I found it fascinating that there was a thriller/mystery to the improvement meme and the duplicates of people. There was always something happening in this book, which was why I liked it. You would read about something, turn the pages and SOMETHING ELSE HAPPENS! My mind literally exploded! Overall it was a fantastic storyline. Completely nothing like I've read before, and I enjoy reading fresh new stories. The cover of this UK edition is so bright! But I like the fact that it's bright. It means you can see it on your bookshelf clearly. The font of "Twinmaker" and the author's name is awesome as it's my favourite colour blue. It really goes with the yellow, and they work together. There's also an image of someone running. There is a lot of running around going on in this book, so that fits well with that! When I first read the synopsis, I was already hooked. It's a really good synopsis and described well to catch the reader's attention. I wanted to know more about this improvement meme, what happened to Libby, and what's going to happen with Clair and Jesse. There are a few main characters in this book. Clair - When I first was reading about Clair, I didn't like her. She came across as a boyfriend stealer and not a very loyal friend. Throughout the book, she did improve. She got more brave, and fought not just for herself. Jesse - I really liked Jesse. He was willing to help Clair no matter what and I really enjoyed reading about him. Libby - Libby really annoyed me. Even though she wasn't in the book much, she was WAY too obsessed with herself and her looks. Zep - I didn't like Zep at all. He just came across all sneaky and creepy and annoying ha ha. Q - Q is a mystery, but I really did like the character. I thought they were awesome, and probably one of my favourite characters from the book. Overall I liked most of the characters, and they were developed well. The book is written in second person, and the chapters have a short to decent length. The book also has over 500 pages. Don't be intimidated by its size as it's packed full of so many amazing things. I must admit, when I first saw the book my first thought was "whoah" because it is a meaty size. So as you all know big books normally scare me, but I dived straight into this; trying not to think about that. The writing (at times) I did find a little difficult as it was a lot to take in, and there were times when it was a bit confusing. It did take a lot of focus to learn about the world. I'd say if you're reading this to make sure you're fully focussed. The actual name of the title when referring to the book, I didn't get until way into the story. 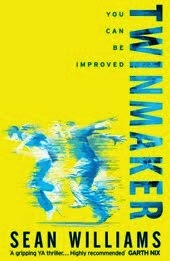 It is called Twimaker because there are duplicates of people in this book. I really like the title of the book as it is what this story is about. I thought the beginning of the book was really good. I was straight in and wanted to dive into the world and learn more. WHAT WAS WITH THAT ENDING?! HOW DARE YOU, SEAN WILLIAMS! Because of that ending, I want to read the sequel and can't wait to. It was a great way to end the book. So overall I did enjoy the story, and I gave it four stars. I honestly can't wait to see what Sean Williams will bring in the next book. Yes I do. I hope you buy it and enjoy it! Great Review! I also got this for review so I was really interested to see how i'd like it. Glad you loved it so much. It's interesting to see the different covers as our is so different from yours. Yeah, normally I like American covers more, but ours for this is SO bright! !